Ruta Nº 89 s/n. Los Árboles. A small and exclusive estancia, Posada Salentein is surrounded by the vineyards of Bodegas Salentein at the foot of the Andes Range. Some of the activities that may be performed are: special visits to the winery with tasting Salentein wines, visits to Killka, the Art Gallery, rides in Finca San Pablo, visits to Killka Salentein Area, bicycle rides and games. 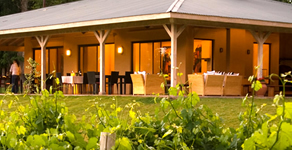 The Inn has a reception area with a business centre, a large dining room with a gallery with view of the vineyards, a kitchen equipped with last generation technology, a parking lot for 20 cars, a swimming-pool, and innovative landscaping and garden design. 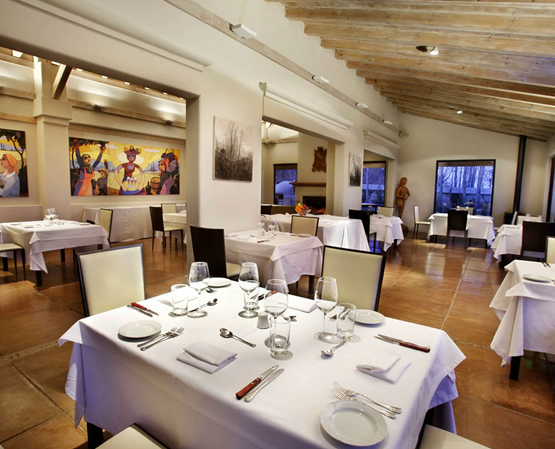 The Posada’s cuisine has a distinctively Argentine hallmark, with a gourmet touch in the look and feel of its meals. • Shuttle service between our farms. The Inn has 16 double rooms distributed in three houses where peace and simplicity reign, and guests receive personalized treatment. • PIC-NIC at the Manzano Histórico. 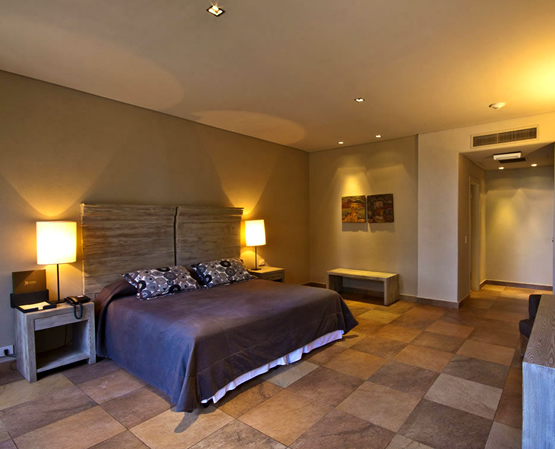 For both guests and day-visitors, Posada Salentein offers an ambience of rest and relaxation, and an exclusive restaurant to enjoy first-rate cuisine, paired with the finest wines from Bodegas Salentein. Our menu includes the best regional and international dishes, prepared with such culinary techniques as terracotta oven, barbecue and vertical spit. The cozy restaurant with the fireplace and salamander stoves has extraordinary views of the Merlot and Pinot Noir vineyards. In preparing our dishes, the first thing that comes to mind is to use local produce, including lamb, a selection of beef cuts, pork, a variety of fresh vegetables, and seasonal fruits. We aim at the best possible quality, taking care of products to preserve their properties intact, and creating tasty dishes, done at the right point, and attractively served. Seasonal fruit marmalades served with camp bread for breakfast, crunchy butter croissants and whole wheat bread— we dive with both hands into every dish that comes out of our kitchen. We cater for two cuisine styles: brasserie, with tasty meals smoked on wood or cooked on the plow disk, hot casseroles in the iron pan, special beef cuts barbecue, delicious empanadas and bread loaves baked in the terracotta oven, and our vertical spit, with the most juicy and tasty ribs. The other style is a selection of our three-course menus: starter, main course and dessert. 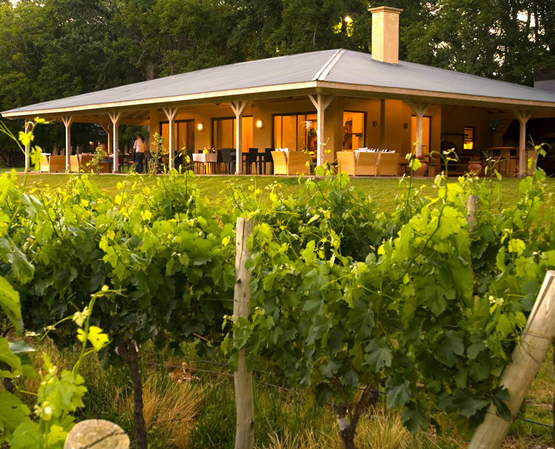 We welcome guests with a glass of wine and an appetizer with the flavors of traditional Argentine cuisine, such as crispy empanadas or a delicious tomatican (corn and tomatoes stew), paired with a carefully selected wine from the Salentein Family of Wines. This way we make sure our patrons can taste a wide variety of our excellent wines. We delight visitors with warm and personalized service. Our waiting staff makes them feel at home, and with their professionalism they convey the essence of the landscape, the mountains and the relaxed atmosphere. From the vineyards in the upper reaches of the Valle de Uco, high on the eastern slopes of the Andes, Salentein is changing the face of Argentine winegrowing. The four wings converge in a circular central chamber, which resembles an amphitheater and was inspired by ancient classical temples. The Salentein estate consists of 2,000 hectares (4,942 acres), 700 hectares (1,124 acres) of which are planted to grapes in three estate “fincas”. The fincas, where grapes are grown at a range of altitudes among the highest in the world, are irrigated with pure mountain run-off, which creates lower pH in the grape, resulting in higher acidity, more color in the wine, and greater ageability. The region´s thermal amplitude ranges as much as 16°C (29°F) from daytime highs to nighttime lows. 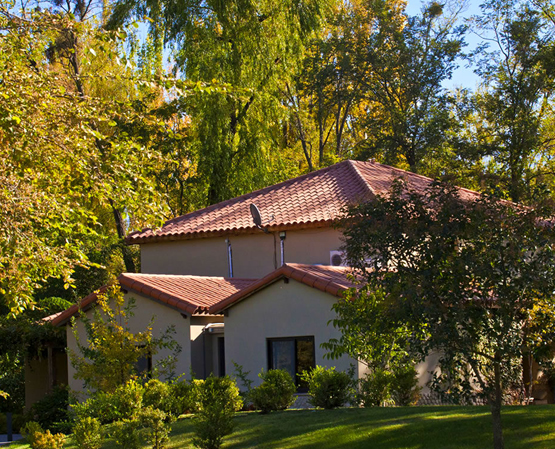 Posada Salentein is located in Finca La Pampa, Tunuyán, Uco Valley, just one hour and a half from Mendoza City.